has 5 PowerGlide™ blades spaced closer together to help reduce pressure with less irritation and more comfort. have a patented blade coating for incredible comfort. built into the back of the cartridge. Perfect for tricky places like sideburns, under the nose, and around facial hair. power up with the Fusion Power razor. 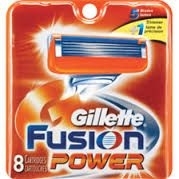 For questions or comments about this product please call 1-800-GILLETTE or visit www.gillette.com.